The Kangaroo can hop right into any sewing room and fit perfectly. The Kangaroo has a three-position airlift that holds most sewing machines comfortably and moves effortlessly up and down. The wide room in front of the lift allows the sewer to sit comfortably in the correct center needle sewing position. 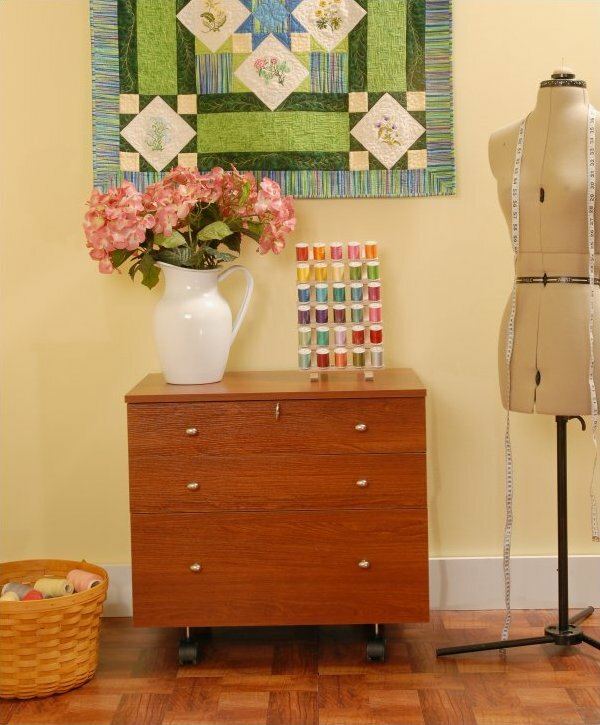 The Kangaroo comes with a quilt leaf on the back of the cabinet that folds up or down and will help to expand your work area preventing large quilts or large pieces of fabric from falling on the floor behind the cabinet. An adjustable shelf for machine storage and a large pull out drawer for all your notions round out the features of this hopping cabinet. Need more storage? The Joey storage unit adds three drawers of storage space yet is small enough to store in the Kangaroo’s pouch. The Kangaroo is offered in Beech, Teak, and Ash White melamine to complement any décor. Adopt one of our Kangaroos today!